Is the jig up now that Sam’s body has been found? At the end of How To Get Away With Murder Season 1 Episode 11, it was announced that the body of Annalise’s husband had been discovered, which should definitely propel things forward as the students and Annalise try to keep their part in Sam’s death under wraps. TV Fanatic: We got a lot of backstory into Laurel last week. How was it for you to get that filled in? Karla Souza: Oh, man. That’s something we were all yearning for from the beginning. We talked about it before the pilot was even shot with Pete [Nowalk, creator] about how maybe Laurel’s wardrobe didn’t suggest she came from a wealthy family but my character would be someone who wasn’t wearing the Prada, the Versace, the Dolce Gabbana but she was someone who probably had more money. Also, another thing we talked about before shooting the pilot was how he thought Laurel’s family was a family where she didn’t find comfort, she didn’t find that warmth and she wasn’t very connected with them. The last episode, when we got a glimpse of everyone’s backstory, I feel like it gave so much depth to our characters. Twitter went crazy over me speaking Spanish, which I thought was so funny. There was a hint of Laurel being Latin or some sort of Spanish decent with Castillo, her last name, but I love that they didn’t expect it. When Pete talked about making Laurel Latin, I said I’d love to have it so that that’s not what she was. ‘Oh, she’s Latin.’ I wanted it so that’s not even a thing. She speaks Spanish in different places but that’s not the first thing you think of her, it’s not a label. I was really happy to see everybody so shocked. I remember I got the dinner scene and I talked to Pete, ‘The scene’s in English.’ If I was going to diss my father at a table, I’d do it in a language they’d understand. Pete took that into consideration and the next day I got the scene and it was in Spanish. I was very pleased. TVF: I always ask Pete who we should not underestimate and twice he’s said Laurel. Do you think she’s someone we should not underestimate? KS: I definitely have underestimated her! I’m guilty of that, too! When I read the pilot and see how it has developed, I’ve been very surprised to see…first of all, in the pilot, we didn’t know it was Annalise had told Wes to do all those things, right? Then, when I started to think about it and watch the pilot again, Laurel’s the one who says to hide the murder weapon in plain sight, she’s the one who comes up with the idea of burning the body, she’s the one who has all the thoughts Annalise had without having her tell her that. So I thought, she’s really a step ahead of everyone. Then, when everyone’s starts to crumble in the last episode, she’s bringing them together and she also is the one helps Connor and Michaela realize that them going to the police is the stupidest thing they could do. I think she has a special way in the group. In the beginning it was because they thought she was just Frank’s girl so I think all of that is out the window and she owns her place now. And in her relationship with Frank she now has the upper hand and I’ve been thinking a lot about that relationship and it’s not sexual but also a meeting of the minds. How to Get Away with Murder Promo - "She's a Murderer"
TVF: Once we saw her backstory with her family and you see how she is with the group, she is kind of making a family there, right? Do you see it that way? KS: Yeah, completely. What I wanted to show with that scene with the family is Christmas was that she doesn’t have a Plan B. She can’t rely on her father or her family so she has to make this work. In a sense, if any of us went back and our families were there and we felt we could find some help with them, maybe we wouldn’t even go back to school! [laughs] I feel like the stakes are really high for her and knowing she’s distanced from her family…that’s why she wants to bring everyone together. That’s why she tells Wes because it wouldn’t have been a good outcome. We were all involved in a felony murder and we would all be put in jail and wouldn’t be able to pass the bar. I don’t know if you know but you can’t pass the bar if you have any criminal record at all. Our futures would be completely demolished so I feel like sometimes they don’t think of those things…[Laurel] is helping them. TVF: Will we see Laurel crack moving forward like some of the others are cracking? KS: Yeah, definitely. Something I wanted to do, I went through episodes 1-9 and I remember seeing on paper that she’s the strongest one and thinking it all out step by step but I also made it that all of that is bottled up trying to hold down those emotions so I gave her that vulnerability. I did want her to be crumbling down with Frank whether she was manipulating him or not but that was an outlet for her. I feel like she’s breaking down about that night but she’s making him think it’s about something else. Now that they’ve found Sam’s body – or they haven’t, who knows? – as long as Annalise is on their side, I think Laurel thinks they’re okay but the question is whether Annalise is going to still help them or turn on them and help herself. I think that’s when Laurel could definitely be breaking especially this new clue they find in the woods that will lead to an arrest will shake the whole How To Get Away With Murder once again. That’s going to be interesting to see them all once again almost flip out. 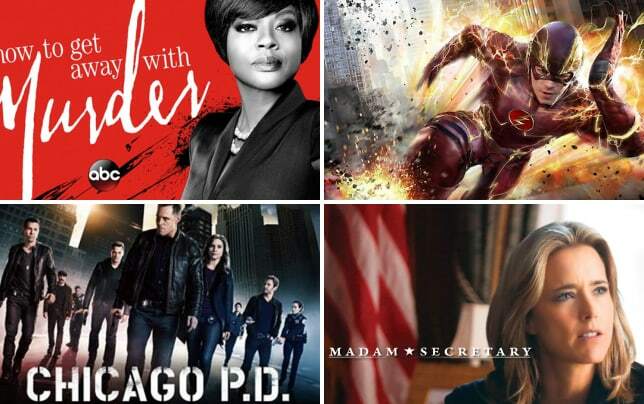 How To Get Away With Murder Season 1 airs Thursdays at 10/9c on ABC. 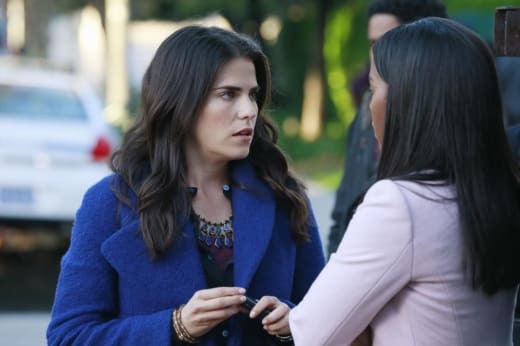 How To Get Away With Murder Exclusive: Is An Arrest on Tap?